World class business experts suggest number #1 task you should do is to have absolute clarity regarding your ideal client in as much as detail possible. Philip Kotler, the Father of Modern Marketing, stated, "There is only one winning strategy. It is to carefully define the target market and direct a superior offering to that target market. Our business is not to casually please everyone, but to deeply please our target clients." Using world's most comprehensive buyer persona guide for the salon, get clarity about your ideal salon clients NOW. Buyer personas are a detailed generalised representation of the best buyers or the ideal buyers so we know exactly who they are so their demographic, psychographic, geographic, behavioural characteristics, but most importantly their buying behavior regarding what they buy, when they buy, where they buy, how they buy and critically why they buy. 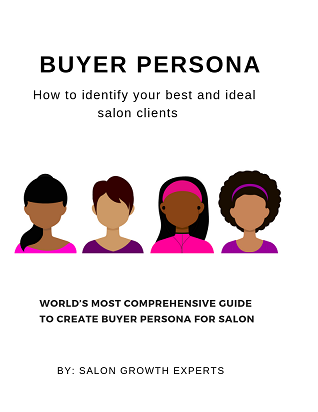 What is a buyer persona guide for the salon? This is the world’s most comprehensive buyer persona guide ever created for the salon. This guide would help you to create, test, modify, retest buyer persona. So you can get amazing insights which would help you to take the business to the next level. What are the benefits of buyer persona guide for the salon? Deep understanding of buyer profile and their buying behaviour. The organisation becomes client-centric. Clarity about existing clients, best clients, ideal clients as well as negative/worst clients. A shared understanding of buyer makes sales, marketing and client service much more effective because of clarity and consistency. Increase marketing effectiveness by contacting the right client, with the right content or offer at the right time. Generation of more quality leads, better lead nurturing, therefore, better lead conversion. You can shorten the sales cycle. Identify opportunities for the development of new services and products as well as the improvement of existing products and services. Anyone who needs to get clarity regarding who are their client, who should be their clients and how to get new such clients. This guide is applicable to the salon of any size and type. Who are Your Existing Clients, Best Clients, And Ideal Clients? This guide has also following eight sections. Each section has a subsection. Alternatively, you can use our ready-made user-friendly buyer persona software to go through this exercise online. It would more effective and efficient to do using the software especially when multiple people want to do do this exercise. You can also create, update and save the persona. 1. There are free buyer persona guides available. Why should I buy this? Of course, there are many free buyer persona guides. 1. All guides follow a rigid structure which may or may not suitable to your unique style or your client’s requirement. 2. We have spent countless hours to produce this most comprehensive guide. We have defined more than 100 criteria. More than 80 such criteria have multi-choice values so you don't need to waste time on research. You don't need to ask your client to think. Let you or they choose values most applicable. 3. This guide has many questions and exercises which could transform your business or your client's business. 2. While creating buyer persona, what is the most important demographic, psychographic, geographic aspects or buying behaviour aspects? Both are important. You can't ignore either of them without a deep understanding of buyer behaviour mere demographic, psychographic, geographic aspects wouldn't be much useful. Without demographic, psychographic, geographic aspects, just buyer behaviour is not inadequate as you can't practically apply. 3. How many personas do we need to create? How long it takes to create a single buyer persona? It depends on your marketing strategy, resources you have to execute. But around 3-5 persona is generally enough. First focus on buyer persona who can give you maximum revenue in minimum time, so you can get buy-in from other stakeholders. Again, it depends upon the resources you have to carry out research to find out demographic, psychographic, geographic profile as well as conducting a buyer interview and then compiling everything and produce buyer persona. 4. What needs to be taken care off, once I have created buyer persona? Use them. How you can apply in various functions of business such as sales, marketing, and client service. Keep refreshing them as buyers are dynamic.